The "Freddo Formula" and what it means for you. Over the last few years the boring statistics from the Bank Of England & Government have been cast aside for a new "Standard Unit of Inflation Measurement" - The humble Cadburys Freddo chocolate bar, a staple ingredient of many school lunchboxes. Sadly over the last ten years the price has risen dramatically, from 10P to 30P! (Some can even remember the hallowed days of 5p Freddos... whilst others speak between sobs of prices as high as 35P!) 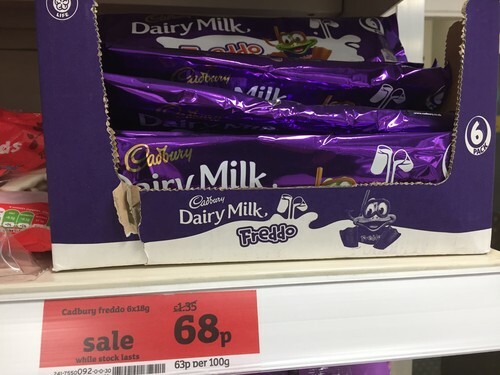 However I imagine that Cadburys are pretty chuffed they have maintained sales whilst tripling prices! The Freddo formula works for them! Has your salary or commission grown at the same pace? Probably not. Has your opportunity for advancement, development or training grown? Possibly not. As you can see from the picture above, we are blessed with opportunity here at Priority Recruitment. Over the last year our team has grown, whilst giving the same great service to clients & candidates - this means we are now blessed with lots of vacancies. What does this mean for you regarding the "Freddo Formula"? Well not every employer is the same, whilst commission goes back in businesses it moves forward in others. Whilst some shelve their training and development plans, others invest in theirs. Whilst some businesses shrink, others are growing, even in these tough economic times (mustn't mention brexit, mustn't mention brexit, mustn't.... dammit). So if you want to find out if there is an opportunity to give you what you are missing, check out our list of vacancies or register your CV - Or just click over to meet our team, pick a consultant that works in your field and pick up the phone for a chat. If you are in Manchester & work in retail sales, why not give Tom Back or Myself a call & arrange to pop in and discuss the fantastic opportunities we are currently working on in Manchester. (One free Freddo per visit)*. Best of luck in making the Freddo Formula work for you. P.S. Whats that? You came from a social media post and you just want to know where to buy Freddos for under 15p again? Oh ok... .Keep scrolling. You've got to really work for a cheap freddo. I'm begining to doubt you really WANT a cheap freddo. *Valid till end of November 2017. Who knows how much they will cost in the future.